If I had a dollar for every time the latest diet fad broke the principles of Intuitive Eating, I would be helicopter-ing over DC traffic instead of sitting in it. Instead of using the HOV lane, I would be HOVering over it. In the most basic sense, there is nothing good about a 'diet'. Someone once mentioned that a diet is all about what you can't do and can't have. Who wants to live that way? Studies have shown that dieting not only hurts your body, but it does not work. Intuitive Eating was a concept developed by Evelyn Tribole, a registered dietitian, who noticed the flaws of a dieting practice and mentality. She came up with ten principles that would help guide a healthy eating practice. While adopting this mentality seems straightforward, it's not. Dieting is engrained within our culture and acceptance, and especially practice, of Intuitive Eating can take time. As someone who needs to see the entire room painted in one color before she decides if it's right for the room or not I need visuals. 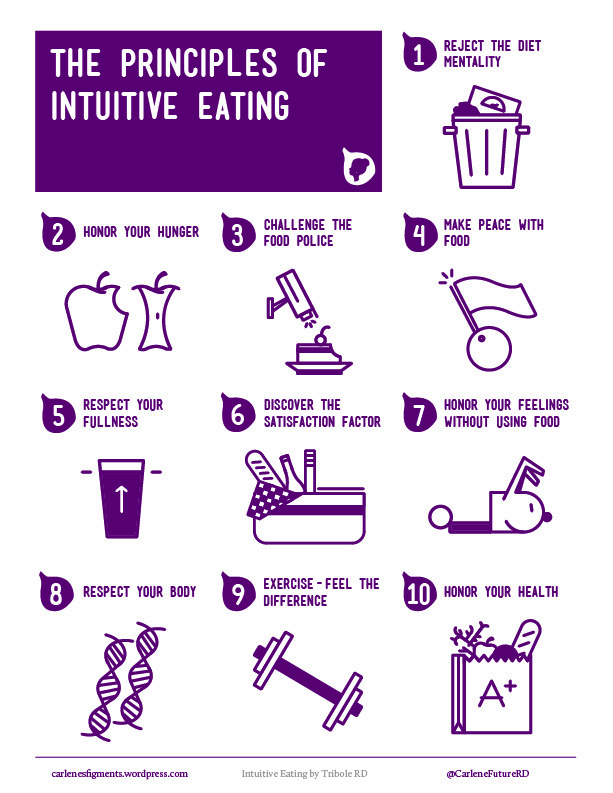 This latest infographic is the basics of Intuitive Eating. I love keeping this in my mobile office (my exploding agenda) for reminders and reference.